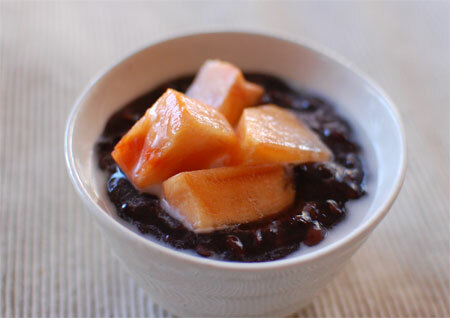 This Asian style sweet porridge is one of my favourite winter sweets. 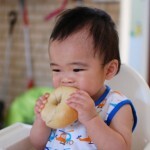 I normally eat it warm, but it can be eaten at room temperature or chilled. It is usually eaten with dash of coconut cream. 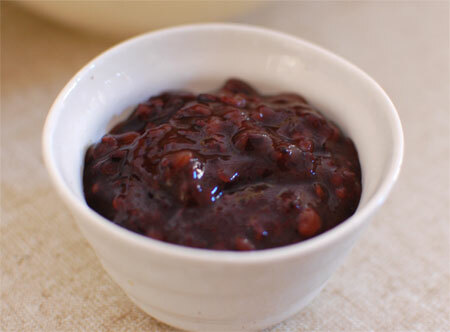 You can cook this in a slow cooker or in a deep pan, just like making congee. Adjust the amount of water to achieve right consistency. I added fresh persimmon to it, and the combination was lovely. 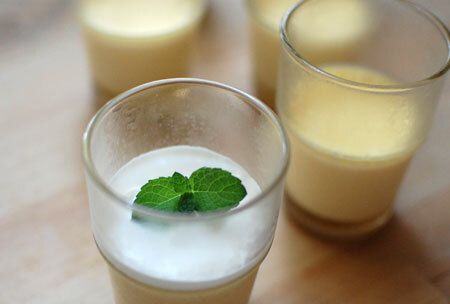 With seasonal fruit and eating it warm or chilled, this sweet pudding can be served all year round! Wash the rice thoroughly and soak in water for about 2 hours to overnight. Put the rice, salt, sugar and 2 L water in a deep pot on high heat until water boils, then lower it to the lowest heat your stove can do. Stir constantly. Simmer. When the liquid is almost gone, check the rice – if it’s still too hard, add more water to it. Keep during this until it achieve the right consistency. 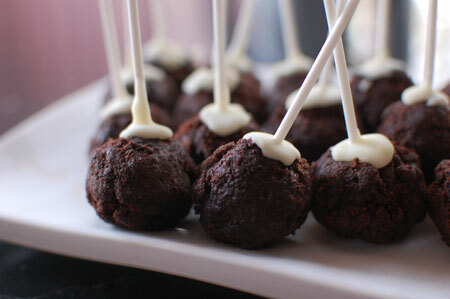 This bite-sized chocolate cake looks so cute, and is a great finger dessert for a party or a lunch box. 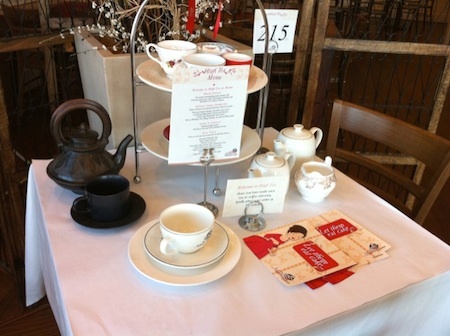 I got this recipe idea from Coles magazine years ago. The recipe used Coles mud cake, but I baked my own and used it for the recipe. I didn’t coat the cake with chocolate entirely as the cake is already rich and sweet. Sprinkled with hundreds and thousands, they turned into fun pops for kids. 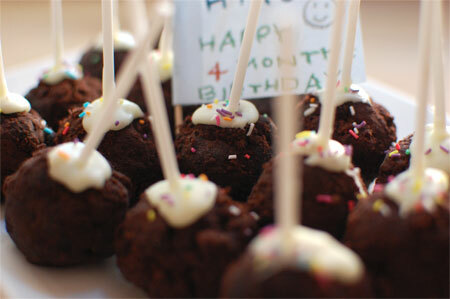 What attaches the sticks to the cake is the melted white chocolate. I got these sticks from Spotlight (sold as “craft sticks”). You should serve this chilled. 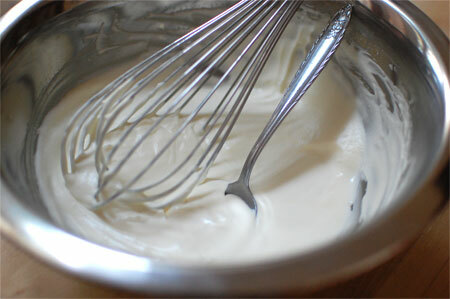 Add sugar to egg whites, and whip until thick and fluffy. Shift cocoa powder and corn flour into the bowl, and fold in. Pour the mixture into lined cake tin, and bake in the oven at 180℃ until just cooked (around 20 minutes). Let it cool. Heat cream in a sauce pan to just before boiling. Turn off the heat, and add chocolate. Stir until all chocolate is melted, and let it cool until spreadable consistency. Slice the chocolate sponge, and spread the ganache. 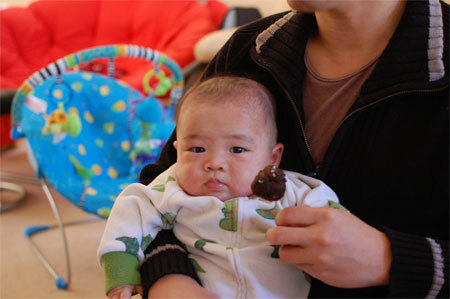 Chop up the chocolate cake, and shape into balls using hands. 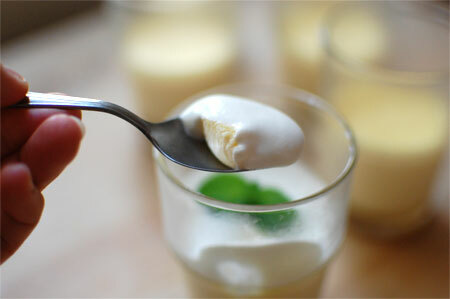 Melt white chocolate in warm water bath. 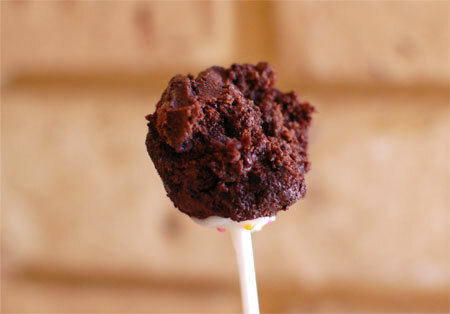 Insert a stick to a chocolate cake ball, and spoon melted chocolate around the stick’s root area. Repeat with remaining. « WeCareJapan: Light / Cotton Blanket x 10000 ! 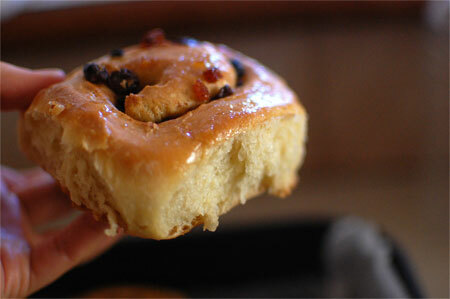 I made some with lots of dried fruits and a hint of cinnamon. It’s was a pretty cold day, but it took only 2 hours to make these. 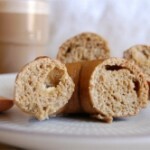 The texture is like between bread and … ummm scone? muffin? It turned out to be more like cake-type bread. Place all the ingredients from “a” in a bowl. 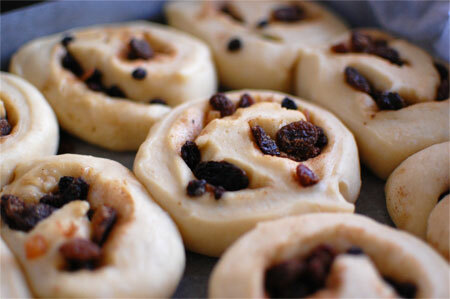 Using a dough hook, turn on the machine to mix the dough for 5 minutes, or until dough is smooth and elastic. 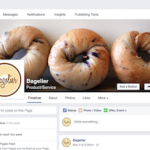 You can knead by hands, too. Place dough into a lightly oiled bowl, cover with a clean tea towel and set aside in a warm place for 30 mins to prove, or until doubled in size. Punch down dough, remove from bowl and knead lightly. Roll dough to rectangle . Sprinkle “b” all over dough. 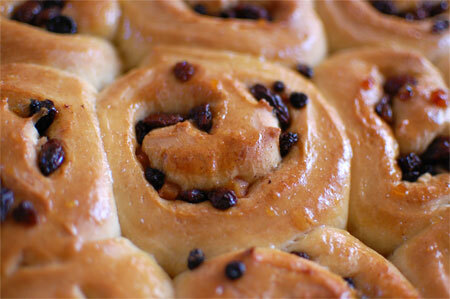 Roll up dough to enclose filling. Cut into 2cm slices. Place in a deep baking pan lined with baking sheet. Prove another 30 mins. Preheat oven to 180℃. Bake for 20~30 mins, or until cooked. Place apricot jam in a heat proof cup and microwave until smooth. While the rolls are hot, brush jam over top to glaze. D has been craving for this sweet and salty popcorn. Personally, I don’t really like too-sugary food, but I remember the popcorn sister-in-law brought us long time ago (post) and I decided to make some at home. 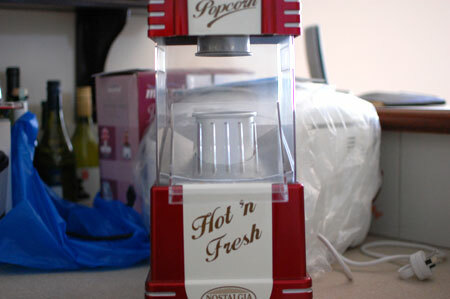 I have many machines and tools for the kitchen, but this popcorn machine has been one of the best-buy. 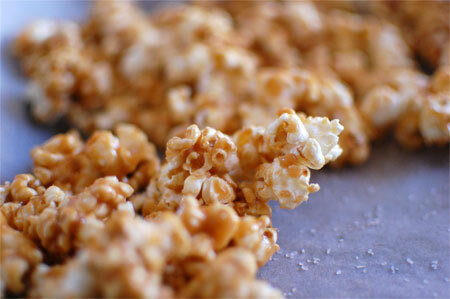 (post) It makes popcorns using hot air (no oil), and they are my favourite healthy snack. I don’t add salt or butter to it. D, however, doesn’t seem to enjoy the plain non-flavour popcorn :p I’m the only one who uses this machine in this house now. It’s a shame, this machine looks so cute and works very well. 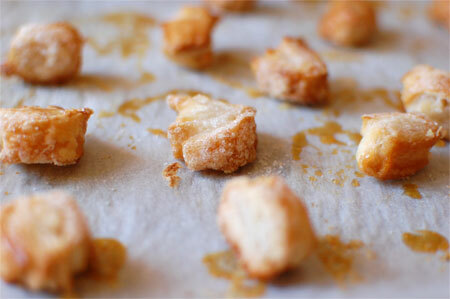 The caramel is sweet and sticky. I would probably get sick of it if it’s just sweet caramel popcorn, but because of the slight saltiness it became addictive delicious snack. It’s a great way to use up old popcorns (plain) too. I tried the recipe from Best Recipes , and added salt once the caramel is cool. 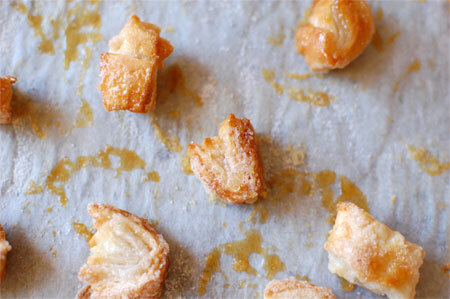 Place the butter, sugar and honey in a small sauce pan, and bring to the boil. Cook until it turns to caramel colour without stirring. 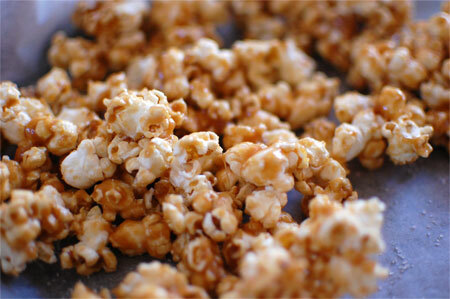 Pour the caramel into a bowl of popcorns, and mix through quickly using a spatula. 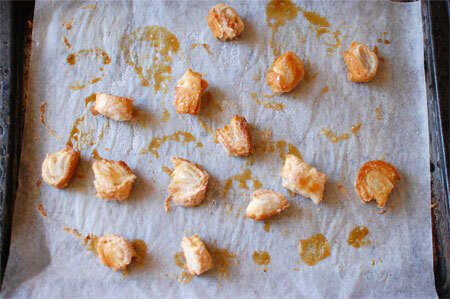 Transfer the popcorns into baking sheet to cool down. Break up the popcorn, and sprinkle salt. Mix through. When handling caramel, be careful not to burn yourself as the caramel is very very hot. To wash the sauce pan, simply fill with water and bring it to boil. Caramel is very difficult to wash when it’s cold. The pudding you get here in Perth is little too sweet. And, not milky! So I decided to make one myself..
… and, it turned out GREAT. The key is not to overcook when you steam the pudding. Remove from the steamer while the centre is still soft, and the inside will be just cooked by the heat. I add a layer of caramel sauce at the bottom, and a layer of whipped cream on the top of the pudding. Yum! Mix the eggs and yolks in a mixing bowl. Try not to whisk too much and don’t let any air go into the egg mixture. Place the milk, cream and sugar in a pan, and gently warm up over medium heat. Pour it into the egg mixture, stirring as you pour. Add vanilla extract to the bowl. Divide the mixture into 6 heat resistant cups. Place the cups in a deep pan, and pour water so it comes up to half way up the cups. Turn on the heat. When the water starts to boil, place aluminium foil on top of the cups to cover. Turn down the heat to low, and place a lid. Steam for about 10 minutes. 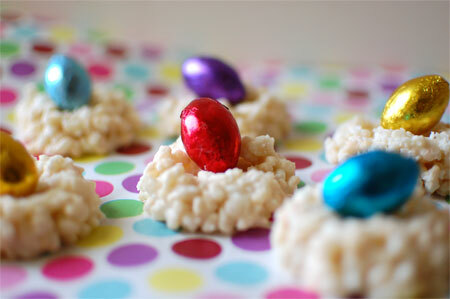 This “white nest” is nothing special, but everyone does love them, especially with white chocolate. Does anyone hate white chocolate? Maybe? Personally I love white chocolate. 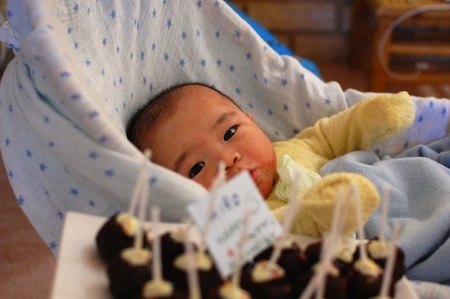 It’s sweeter than milk chocolate, and looks so cute when used in cooking. D loves white chocolate (he doesn’t like milk/dark chocolate) and has been eating this nest everyday since I made! Melt chocolate in a bowl, over a pan of hot water. Be careful that the bottom of the bowl holding the chocolate does not touch the hot water. Stir in rice bubbles and coconuts, and mix through. 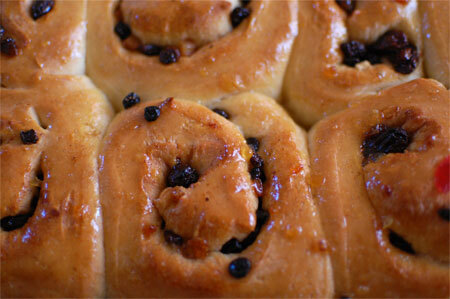 Using two spoons, drop the mixture on baking sheet – shaping into circle and make a dent in the centre. Repeat with remaining. When it’s set, place an Easter egg on each nest. 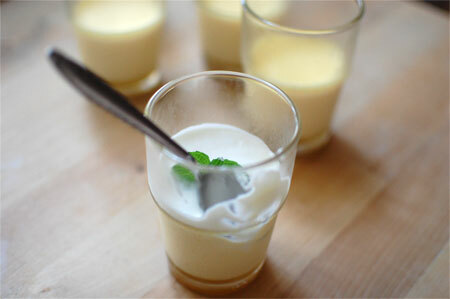 I made this orange mousse on the BBQ (post is here), and everyone loved it. 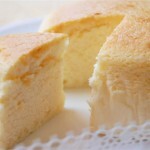 I had made cheese cake as dessert already, but in the morning I thought I would make one more dessert. 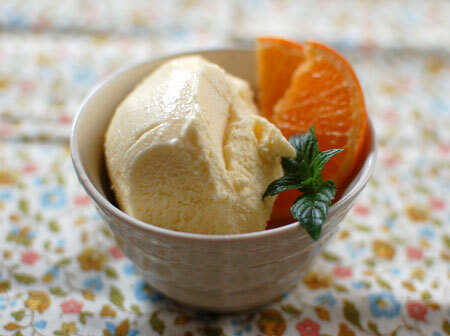 This mousse is such easy to make, and you can actually use bottled orange juice you have in your fridge – if you don’t have any fresh oranges. That’s what I used, and it tasted as good. Soak gelatine in 2 tbs water. 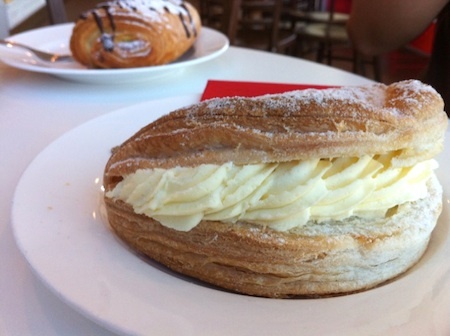 Whip the cream to the soft peak. Place water and sugar in a sauce pan, and simmer over medium-low heat, while stirring with a silicon spatula, till the sugar dissolves. Turn off the heat, and add the gelatine. Stir well to blend. Transfer the gelatine mixture into a mixing bowl. Add orange juice, lemon juice and cointreau, and mix. Place the bowl over iced water. Stir until the mixture become slightly thicken (but not until the gelatine sets). Mix the whipped cream to the mixture. Blend well. Pour the mixture into a mould, and keep in the fridge until it sets. 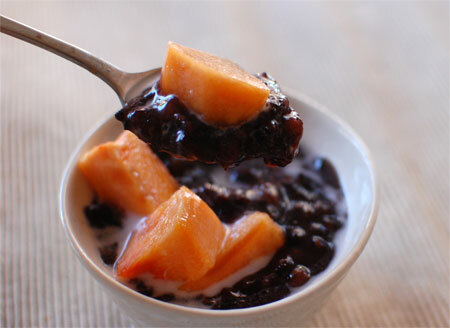 It’s a perfect dessert in summer. 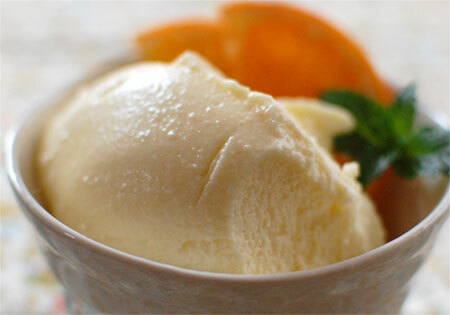 Enjoy with orange coulis, whipped cream, or fresh fruits! 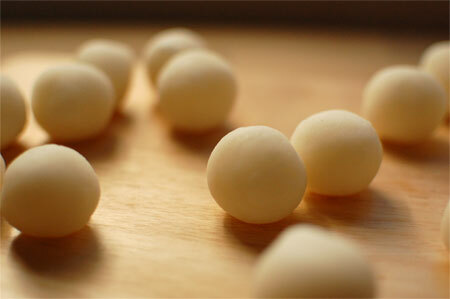 Dango is one of my favorite Japanese sweets! I love the chewy texture. Sanshoku-dango (three-color-dango) and mitarashi-dango are must item for me for 3PM tea time, and always get one or two while I’m in Japan. 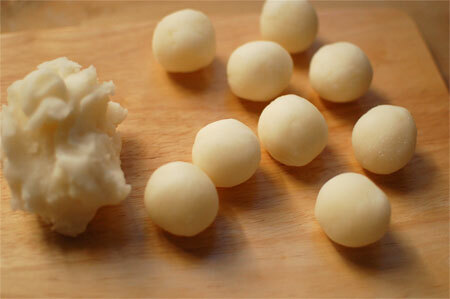 I happened to have joshinko at home, and made mitarashi-dango using a recipe from my grandma! 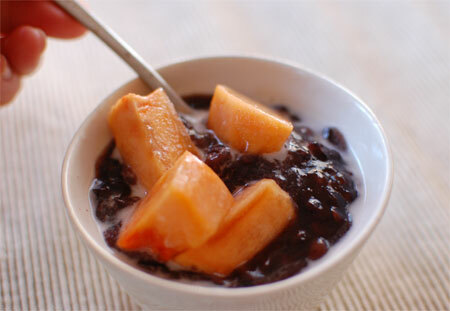 To make dango, blend all dry ingredients in a bowl. Add water and mix until smooth. Place the mixture in a sauce pan, and cook over low heat, stirring constantly, until thicken and the color is almost transparent. Remove from the heat, and cool. Meanwhile, prepare a steamer. Start boiling water, and line baking sheet on the bottom of the steamer tray. When the mixture is cool enough to handle, shape into small balls by hands. You can use corn flour if the mixture keeps sticking to your hands. 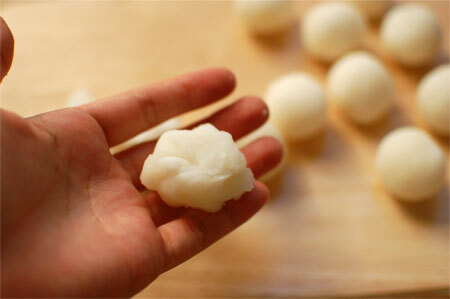 Arrange the dango on the baking sheet, and steam for 20 minutes. 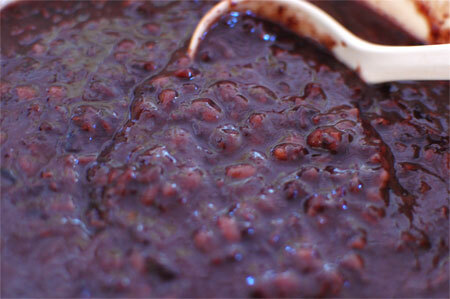 To make sauce: place water, sugar and soy sauce in a small sauce pan, and simmer until the sugar dissolves. Mix corn flour with 1 tbs water. Gradually add the cornflour mixture into the sugar water, stirling constantly, to thicken the sauce. Pour the sauce over dango and serve. If you like better flavour, grill dango slightly and caramelize the sauce over the heat.